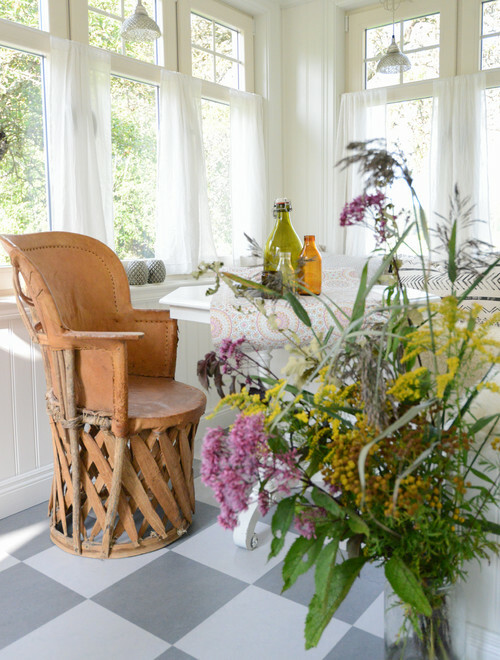 Once in a while you get lucky and a popular designer shares their own home. 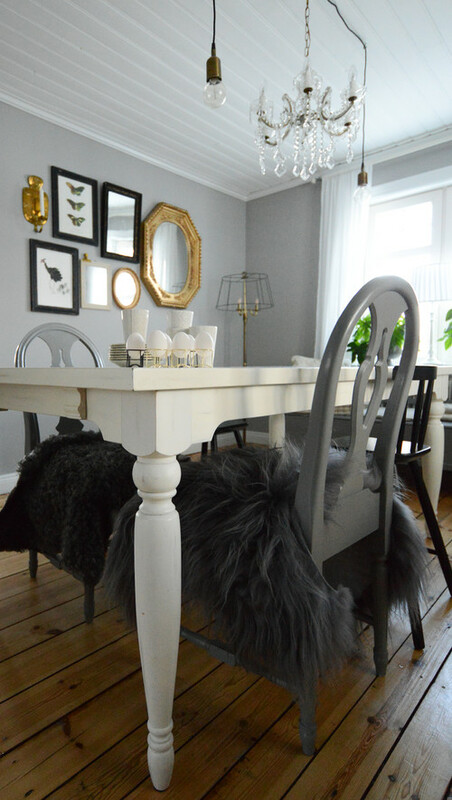 Such was my luck today when I came across the home of Swedish designer Anna Stenberg on Houzz. 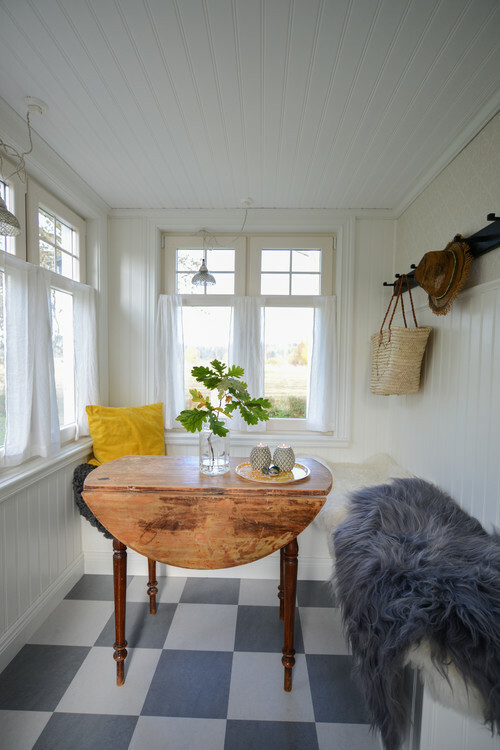 Scandinavian design is evident throughout the rooms of this cozy cottage. The porch is surrounded by windows that let in plenty of natural light, which is so important during the short gray days of winter. White walls and ceiling bounce the sun around, maximizing the light in the room. 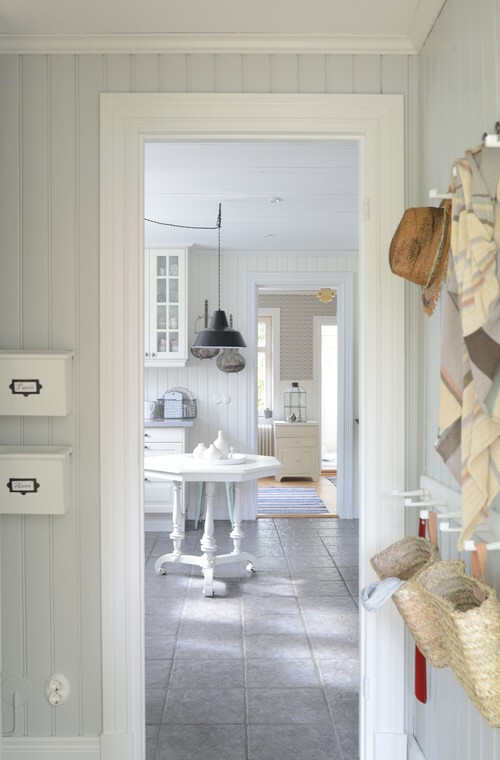 Simple curtains and a checkerboard floor provide a cottage touch. The entryway contains handy pegs for hanging coats, hats, and purses. 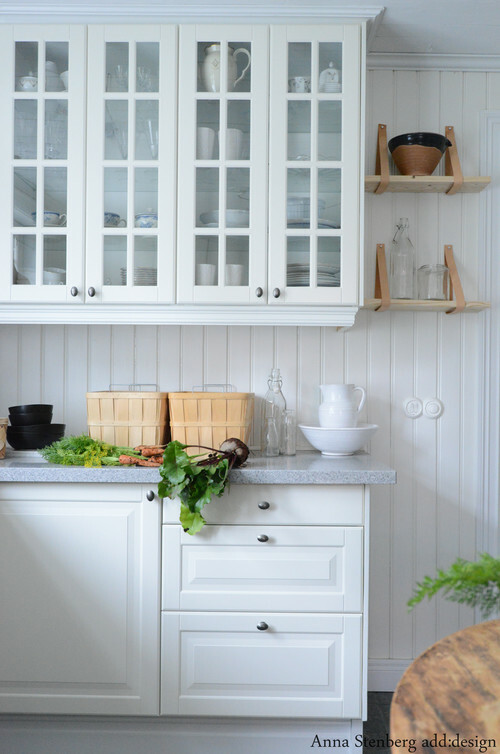 Step inside the kitchen where planked ceilings and walls are painted white. Pale gray counter tops repeat the hue of the tiled floor. Glass front cabinets create the illusion of more space in the room. Simple shelves hold decorative pieces. A wood table adds warmth to the space. Baskets can hold oft-used supplies, or even fruits and vegetables. The dining room features a pretty chandelier flanked by Edison-style lights. Gray chairs accomodate fuzzy throws for softness and warmth. The rich wood floors are beautiful underfoot. 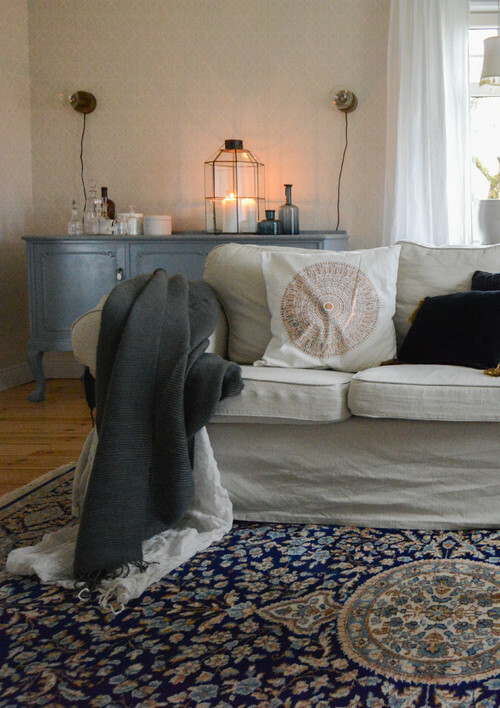 A comfy slip-covered couch takes center stage in the living room while a patterned blue rug adds color and interest. 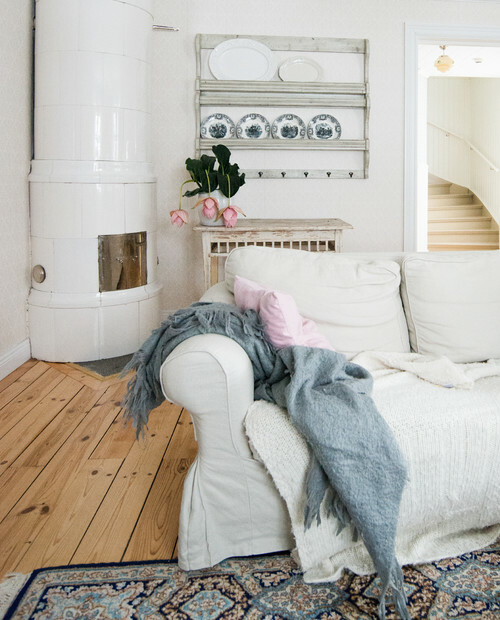 The room also features the classic Swedish fireplace that helps to warm the Swedish designer’s home during chilly months. The bedroom is uncluttered and peaceful. I like bedrooms that don’t have a lot of stuff in them. A handy shelf is added to the back of the door. 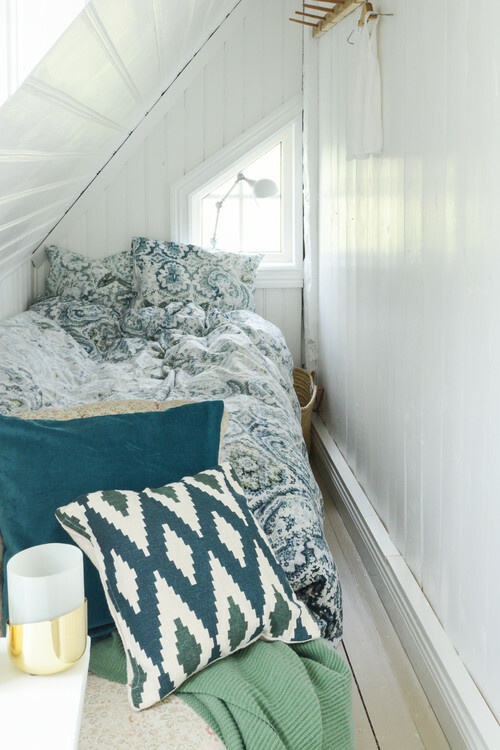 A small under-the-eaves room is transformed into sleeping quarters. 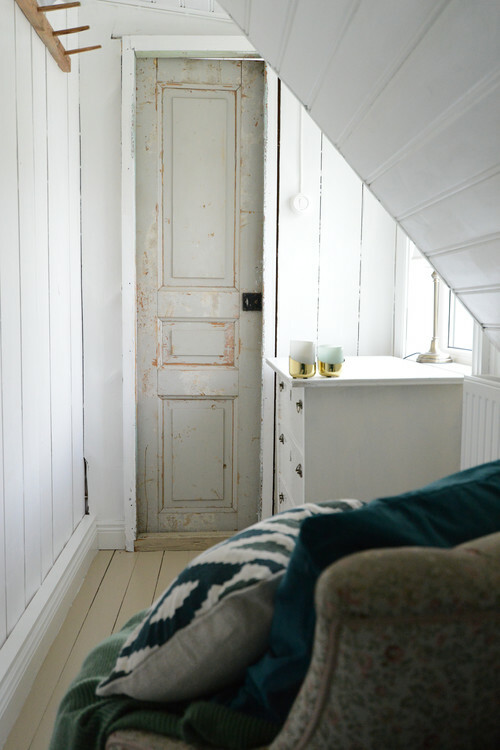 White ceilings and walls keep the room from appearing claustrophobic. 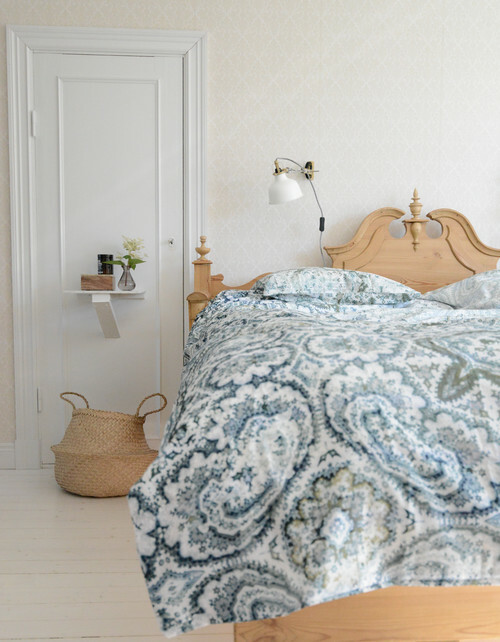 It would feel so cozy to spend the night in this room – almost like sleeping in a cocoon. The door to the bedroom is tiny, too. 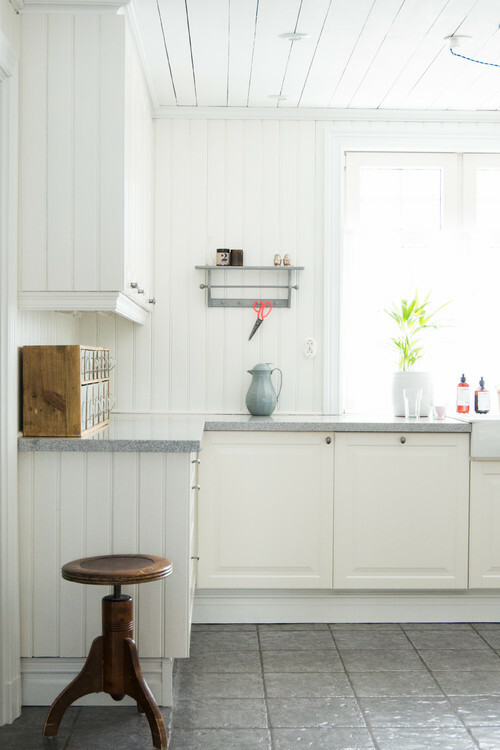 The Swedish designer’s home has lots of simple, architectural appeal. So charming and livable! 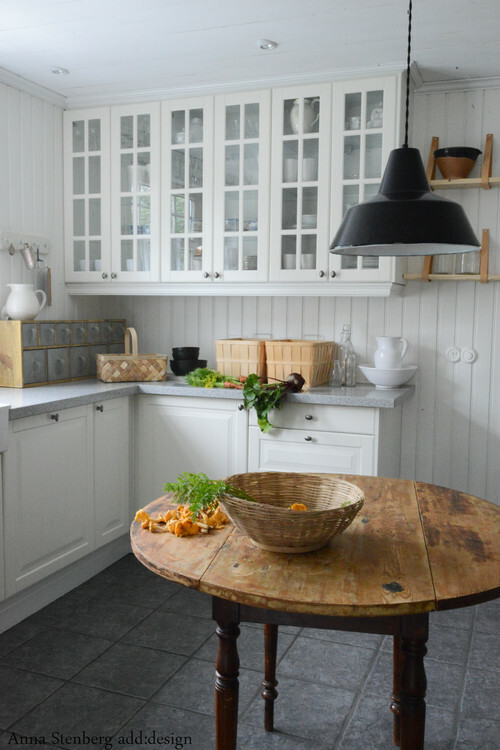 You can see more of Anna Stenberg’s Swedish home at Houzz. Can’t say that I am very impressed with this home. It’s too sterile for my taste. ???? All white is so pretty in picture, but in real life it gets dirty easily and yellow. I had a white kitchen before the hard wood cabinets and yes, they were yellow. Its quite lovely and I really like white, just not the entire house in white, but still, it is very pretty. However, I am wondering why i the first picture of the kitchen, viewed from the entryway, the table in the center of the kitchen is solid white, but in the next picture, it is the same table, in a stain. Curious. This home needs some color to give it more warmth, but love all the natural light. I love the plainness of this home yet so comfy. You would want all white although i guess the snow they get is white. They have cold long winters and the greenery would make it seem warm. I love their fireplaces. Very sweet cottage. I am a big fan of white and neutral decor. I think she has lots of touches of color and texture through out her home. Thanks for sharing.